Lawyers Thursday offered free legal services to the vulnerable, marginalized, and indigent in society in yet another move to ensure justice to all. This was the second time members of the bar were carrying out the exercise as part of their corporate social responsibility after a similar one was held around the same time last year. 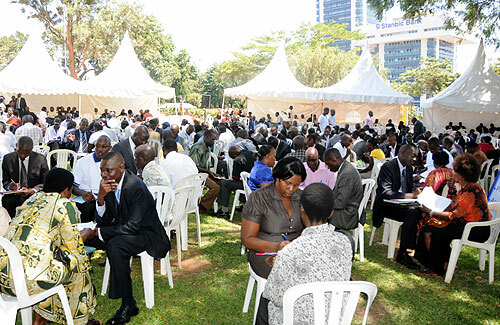 People with cases including land wrangles, criminal, domestic, employment, accidents, children and women’s rights flocked the parliamentary gardens opposite the Kampala Serena hotel to get the services. It was a humble gesture as lawyers clad in suits ties attended to the poor clients, registered their cases and gave then legal advice. Join the International Hand Foundation in our social media efforts to spread awareness of the need and the progress in Uganda. Visit us on Facebook page or Twitter. Thank you!